Bush-craft and Survival School is a one day introduction to survival techniques and skills in the outdoors. Have a look around and you will see we offer a great service with regard to the equipment and instruction at the best price! It must be understood that this course isn't for your hardened outdoor survival and bush craft enthusiast, we supply all the equipment for the sessions and then give you information on all the equipment you will need to ensure you have a very comfortable wilderness bushcraft experience on your own. We don't get you to buy your kit through us, we offer advice on where to buy the cheapest and in most cases how to recycle and make your own kit cheaply or even better for FREE! Survival isn't all about living off the land, it's also about being prepared, having the correct equipment and the right amount of food and water to last you for the duration of your stay in the outdoors and a little extra for the unexpected. This was a fantastic course which was very well organised and also very informative. Both Dave and Chris' expertise was evident. The highlight for my 8 year old son was the sawing, whittling and fire lighting whilst for me a brilliant 'sail' on the canoes back up the lake. Dave and Chris put on a masterclass of backwoods skills which kept the whole family entertained for over 5hours - no mean feat! The highlight was the shelters we had to build as we all chipped in. Some of the kids were a bit disappointed their dads didn't stay in them overnight though! Click on the links below to watch videos of our bushcraft sessions. Using this equipment we can create a Bush craft camp to suit your teams needs whether for youth groups or adult expeditions and trips. Please e-mail or call us to discuss your requirements. To view some of our Bushcraft survival and wilderness training course pictures please click here survival images. 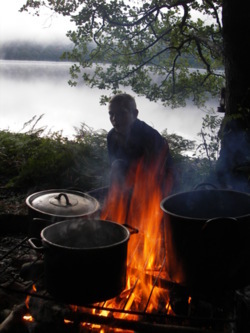 We have many Bushcraft Survival school venues within easy reach of Lancashire, including Chorley, Preston, Blackburn, Bolton, Chorley, Rivington, Anglezarke and Manchester and in Cumbria, particularly around the North Lake District, South Lake District, East Lake District and the West Lake District areas, for example Coniston, Ambleside, Windermere, Keswick, Hawkshead, Kendal, Bowness, Ullswater to name just a few.